The mid-C11 nave has a late C12 south aisle and mostly C15 windows. The chancel is late C14 and the tower is earlier C15. Poling lies down a lane opening off the A27 among flat fields and is one of the few villages near the coast to remain undeveloped. Close to the church, a farmhouse incorporates a preceptory of the Knights Hospitallers, though as this included a chapel, the knights probably did not use the church. The church belonged to the Norman abbey of Almanêches, and in the C13 passed to its daughter house of Lyminster (Lower II p102). It still had the status of a chapel in 1374 (VCH 5(2) p245). The north wall of the nave is 2ft 5in thick (Baldwin Brown p476) and a double-splayed window has an unusually wide external splay. This was opened up in 1917, when part of the wooden shutter was found (1 p73) and is displayed nearby. 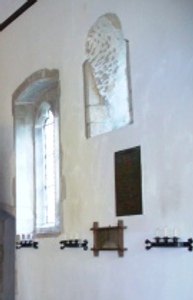 A quoin of long-and-short work under a later window marks the division between nave and chancel. 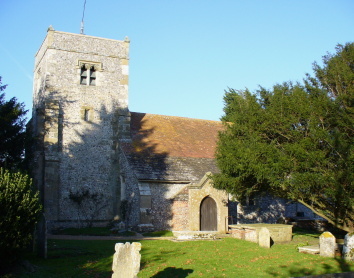 There was probably a chancel from the start, of which the east quoins were re-used when it was altered or rebuilt (see below), as there was little stone locally. The date of this work is mid-C11. The south aisle of c1200 retains a plain pointed doorway and had lancets, shown by the sill of a south one below a C15 window, whilst the head of the west one was made trefoiled in the C14 or C15. The pointed heads of the arcade are slightly chamfered, as are the square responds with plain abaci. 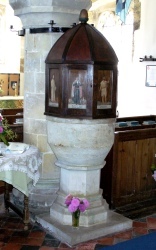 The octagonal abacus of the round pier is unusual and the form is found also at Rogate. The chancel is as broad and almost as long as the nave and may incorporate C11 masonry towards its western end, as well as the quoins. However, it is thought by John Potter (SAC 145 (2007) p84) to be of the same date as the aisle, though the square-headed side windows with slight ogees are late C14. The opening of the east window is also C14, but the form of the original tracery is not known. 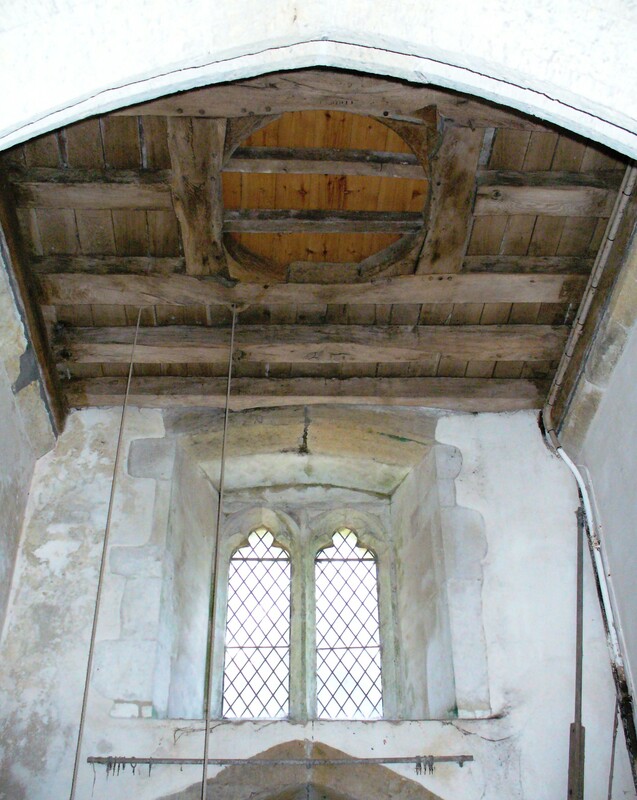 If there was a chancel arch, it was removed in the late C14 at the latest and replaced by a screen and roodloft. The upper and lower entrances to the loft are at the south east angle of the nave. Both have very depressed heads and retain their metal hinges. The upper opening has been disturbed by a diagonal opening in the east respond of the arcade, of uncertain date and purpose. 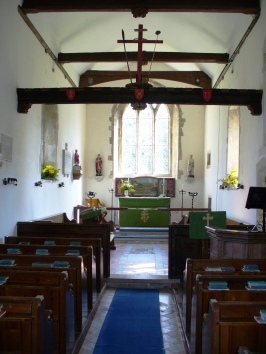 The castellated beam is old, but not aligned with the entrance and so is not in situ, though nothing supports the suggestion that it came from Bargham chapel (BE p308 – see under Angmering). Above this beam is another one with a castellated top and pierced quatrefoils. In appearance this at first seems all C19, but parts appear older and the beam could be another part of the former roodloft to survive. The square-headed aisle windows and doorway (blocked) are early C15, when its retained west lancet was given a trefoiled head. The roof is mostly plastered, but the tiebeams date from this time. Finally, a tower was added with an arch of two continuous chamfered orders, a west window and bell-openings like the other windows and a moulded west doorway. The position of the prominent stair at its north east corner is unusual and so is its sloping stone roof. The plain parapet around the low cap is not in its original form, but the Sharpe Collection drawing shows it was there by 1805. Repairs in 1830 (2 p1) included the east window of plain intersecting tracery, the rendered south porch and a west gallery (ibid p6). At this time the Duke of Norfolk presented the carved bosses from the dismantled roof of the Fitzalan chapel at Arundel (ibid p4), which are fixed to each tiebeam. A restoration by G M Hills in 1875 (CDK 1876 pt 2 p91) cost only £611, enough to remove the gallery and put the fabric into good order, but insufficient to replace the east window. There was work by P M Johnston (whose brother lived in the parish and whose monument is in the church (see below)) in 1917 (1 p67), but apart from re-opening the C11 window, there was little obvious change. 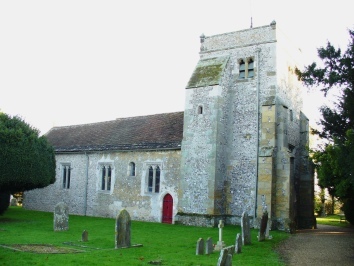 More recently, the church was barely changed after repairs by J L Denman and his son in 1968 (ICBS). 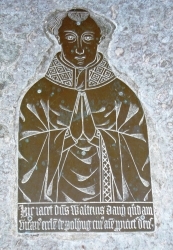 Brass: (Chancel floor) Walter Davy (Vicar, 1442/43-99). A half-figure, vested for mass, with the inscription below. The engraving is finer than usual at the date, though it has not been assigned to any workshop. Roger Birch has identified the slab as Sussex marble, which would be most unusual (p52). Font: Small and tub-shaped. Probably C11 and even probably pre-Conquest in the view of John Potter (SAC 145 (2007) p86), though the chamfer and octagonal moulding on the base were altered later, probably when the octagonal stem was added. This looks C15 in form, though it has been suggested that it is a C19 replacement (www.crsbi.ac.uk retrieved in 15/4/2013). However, like the slab of the brass above, it has been identified as made of Sussex marble (Birch p29), which may speak in favour of an earlier date. Glass: (East window) Reset C17 panel of St Paul with some fragments of C15 bordering. Image brackets: (Either side of east window) Late C14 moulded. Monument: (Beneath roodbeam) Sir Harry Johnston (d1927) Plain tablet carved by E Gill (2 p2). Painting: (East splay of original window) C11 or C12 angel, virtually vanished. 1. (South chancel) Late C14 square-headed, lacking a drain. 2. (South aisle) Also square-headed but with a round drain, probably of c1200. Poorbox: (By south doorway) Probably C17, though it has been dated to both 1285 and 1797. 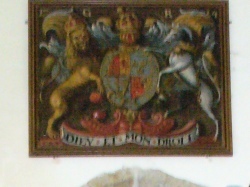 Royal Arms: (Above tower arch) Painted. George I, dated 1724. Screen: The base of the screen, though heavily restored, is late C14.